Don’t be misled, as I rather stupidly was at first; this is not a disc of the most outstanding contemporary works of the last forty years (although that would make a fascinating disc or two). 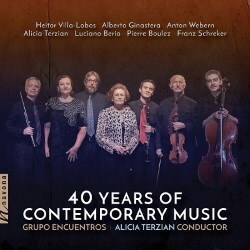 No; it’s forty years of the ensemble Grupo Encuentros under the conductor-composer Alicia Terzian playing together mostly, but not exclusively, in South America and the recordings date back a decade or so. Alicia Terzian hails from Argentina and has written over eighty works; she founded the group in 1978. But the question arises: what is contemporary music? When Villa-Lobos died, Terzian was just about to be awarded a gold medal by the Ministry of Education, so I suppose he seemed reasonably modern at the time. Ginestera was then only in his mid-forties; he is represented by the typically highly-charged and rhythmic Pampeana No, 2 for cello and piano (No.1 was for violin and piano). Webern died in 1945; his music, however, must have seemed difficult and ‘modern’ to South Americans in 1978. As it happens, the eight songs which make up Acht Jungen Lieder are mostly diatonic, even Mahlerian. Their date of composition is rather confused in the booklet with 1899 and 1901-2 offered. But however you look at it, he was teenager when they were written. It’s difficult to see how a late romantic like Franz Schreker might have appeared modern but there is a personal connection with Terzian. A score of Der Wind (a quite impressionistic work) was given to her in 1980 by Schreker’s daughter after Terzian premiered the work in Buenos Aires following its re-discovery, so having it recorded here is quite poignant. The ‘Grupo Encouenros’ consists of a mixture of winds and strings and can include piano, percussion and voice - in this case Maria Blanco, whose rich, dark mezzo suits the Webern songs well, especially as they are mostly slow and reflective. Potentially more challenging for all concerned is Boulez’s Dérive, dedicated to William Glock. Its inspiration is derived from the idea of a drifting boat in the wind and sets out that idea in a limited time span; absolutely beautiful. Even more tantalising is Berio’s O King, composed in memory of the assassination of Martin Luther King; it consists of only the word “King” punctuated by piano and ensemble strikes, rather like a gunshot thrashing the texture. The voice here is a little recessed but the pacing is perfect. With the two, contrasting works by Alicia Terzian, the conductor and one of Argentina’s leading composers, we move into music which is not only chronologically, but also stylistically, contemporary. The percussion piece Yagua Ya Yuca translates as ‘The Tiger Roaring’ - the tiger being the Yagua people, who enact a ritual masked dance on the last day of carnival. Not only is percussion employed but also the player’s voce. Perhaps it’s me, but these fascinating sounds do not seem to amount to much and certainly not to a wild rhythm which” leads them to a paroxysm “. Les Yeux Fertiles has a French title because the composer selected passages from various poems by Paul Eluard (1895-1952). This is a much more original work; it was commissioned by Radio France and sets out to explore microtones, including an evocative humming by all the instrumentalists as well as the dark toned mezzo. Curiously enough, if you were looking for a CD which could lead you into some of the more intriguing and possibly representative works of the twentieth century, then this would do it. The performances and most of the recordings are perfectly serviceable but - and I don’t mean to be in any way derogatory - not outstanding. However, a good overall view of some aspects of the period can certainly be gained and enjoyed.